Need a way to track the performance of your Facebook ads in Google Analytics? With Google Analytics, you can gather the data of your Facebook ad campaigns along with any other marketing campaigns, and quickly and easily analyze their performance. In this article, let’s take a look at how to track Facebook ads in Google Analytics. Why Track Facebook Ads in Google Analytics? While Facebook Ads Manager gives you detailed insights on the performance of your ad, you’ll often find a discrepancy between the data you gather on Ads Manager and Google Analytics. This discrepancy makes it hard for you to understand whether Facebook advertising is a cost-effective marketing channel. The easiest solution to avoid the discrepancy and get accurate analytics is to create URL parameters. By creating URL parameters, you get more accurate data in Google Analytics, so you can discern the Facebook ads’ traffic from the regular Facebook traffic, and easily analyze the performance of your ad campaigns to make more revenue online. We’ll show you how to create URL parameters using MonsterInsights and how to add it to your Facebook Ads Manager account. The first thing you need to do is to install MonsterInsights on your site, and connect it with Google Analytics. 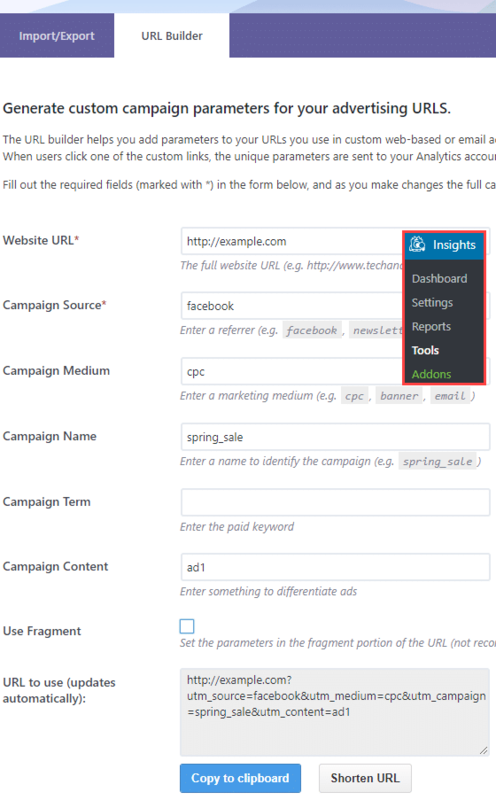 Then, go to Insights » Tools, and click on the URL Builder tab on the top to create URL parameters for your Facebook ad. This tool makes it easy to build your URLs with all the relevant information. You just need to enter the URL you want to track, along with its parameters. Campaign Source (utm_source): It is used to describe the traffic source in which the link will be placed. In our case, it is Facebook. Campaign Medium (utm_medium): It helps you discern your Facebook ads traffic from your regular Facebook traffic. For example, you can specify cpc as your utm_medium. Campaign Name (utm_campgain): You can add your Facebook ad’s campaign name here. It helps you track the performance of all your Facebook ad campaigns. Campaign Content (utm_content): You can specify the name of your individual ad here. After specifying the required details, you can copy the URL and insert it into the Destination URL field in your Facebook Ads Manager. Note: Facebook also offers you parameter tracking within Ads Manager where you can manually add parameters to track campaigns. Since we’re using the URL builder, you can leave the URL parameters field blank. In your Google Analytics account, you can find email campaigns report under Acquisition » Campaigns » All Campaigns. By default, Campaign Name is chosen as the primary dimension in your report. Just above the tabular report, you can easily choose a different primary dimension such as Source, Medium, Source/Medium. We hope this article helped you learn about tracking Facebook ads in Google Analytics. 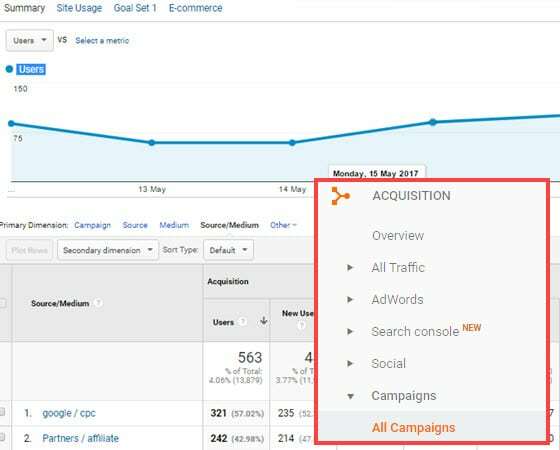 Did you know you can use Google Analytics to track even your offline campaigns? Here are 3 ways to track your offline marketing campaigns. And don’t forget to follow us on Twitter and Facebook for more Google Analytics tutorials.